I’m just shy of 30, and I have advanced cervical cancer. Last year, I lost a 23-year-old friend to cancer. My friends are living with and dying from cancer as our generation stands up to protect our environment. Young adult cancer rates are at an all-time high and correlate to the rise of chemicals in our surroundings. Oil extraction pollutes the air, water and soil. 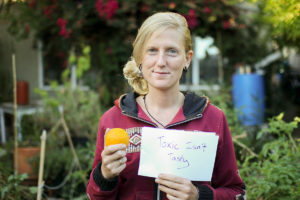 And now, agricultural companies are allowing it to potentially pollute our food? 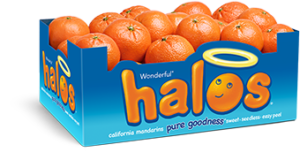 Halos® mandarins—the sweet, seedless, tasty orange perfectly suited for children’s hands. Bee Sweet—with their cute logo. And then both with their pink ribbons! These are what children across the country are eating. Do we really want oil wastewater irrigating the food that we eat and feed to our families and our friends?! And my potential exposure to harmful chemical seems minute compared to the people living in the Central Valley of California where a bulk of our country’s oil is extracted and food is grown. People there live with oil pump-jacks near playgrounds, fracking wells next to community gardens, and with a plethora of respiratory and other ailments. And now farm workers employed by companies like Bee Sweet and Wonderful are exposed firsthand to the chemicals in oil wastewater. For the health of all of us, I urge Bee Sweet and Wonderful to stop using oil wastewater to irrigate their citrus. And I want an end to the oil and gas industries that pollute the water in the first place. I stand with Breast Cancer Action, and all people affected by all types of cancer, to stop these dangerous practices in California.